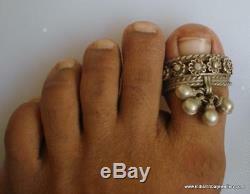 VINTAGE ANTIQUE COLLECTIBLE TRIBAL OLD SILVER BIG TOE RING PAIR (AANGOTA) FOR BIG TOE FROM RAJASTHAN INDIA, USED BY TRIBAL PEOPLE OF RAJASTHAN. NICE HANDMADE DESIGN ATTACHED BELLS IN LOOPS. GOOD FOR YOUR JEWELLERY COLLECTION. Inner diameter side to side - 2.6 cm(1") Width of top with bells - 2.7 cm (1") Weight of pair - 33 grams Material - silver back is coper. 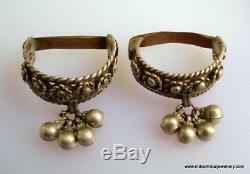 The item "Vintage antique ethnic tribal old silver big toe ring pair belly dance jewelry" is in sale since Monday, August 27, 2012. This item is in the category "Jewelry & Watches\Vintage & Antique Jewelry\Fine\Unknown Period\Other Fine Undated Jewelry". 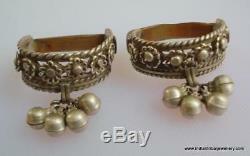 The seller is "indiantribaljewellery" and is located in indiantribaljewellery. This item can be shipped worldwide.